The moderator of a SEMA panel on liability said the session will kick off with a 20-minute presentation on the topic by John Eagle Collision Center plaintiff’s attorney Todd Tracy. AirPro business development Senior Vice President Michael Quinn, who will moderate “Understanding Shop Liability in this new Era of Diagnostics, Calibrations and Programming,” from 9:30-11:30 a.m. Tuesday, Oct. 30, on Monday recalled hearing a comment that body shops have nowhere to hide following the John Eagle case. Tracy proved the liability a shop can incur by deviating from OEM repair procedures with his $31.5 million victory against John Eagle Collision on behalf of a couple seriously injured in a crash. The case was later settled for an undisclosed amount. 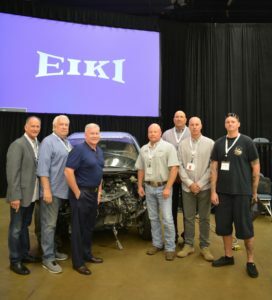 Tracy won by demonstrating to a Texas jury that John Eagle Collision used adhesive to attach a new hood to the Fit rather than the numerous spot welds specified in Honda repair procedures. The jury agreed that this substitution compromised the crashworthiness of the vehicle and exacerbated the severity of the subsequent collision — and injuries — suffered by Matthew and Marcia Seebachan. The Seebachans had no idea about the incorrect repair, which was done for the Fit’s prior owner, according to Tracy. Quinn, a former seven-shop MSO owner/operator, said Monday that the Seebachan case opened his eyes to the concept that a repair could increase crash severity: What if a crash survivor who lost an arm would merely have broken it if the repair was done right? In the past, no one thought about such issues, he said. That case involved an incorrect repair of the vehicle body. But what happens when a collision repairer or subcontractor returns a vehicle with a repair that negatively impacts an advanced driver assistance system or other electronics? That’ll be the focus of Quinn’s forum, which is part of the Society of Collision Repair Specialists’ Repairer Driven Education series. The session features a powerhouse panel including Tracy (Tracy Law Firm), Assured Performance technical compliance Vice President Aaron Clark, Honda collision marketing assistant manager Scott Kaboos, I-CAR Senior Vice President Nick Notte, AirPro operations Executive Director Chuck Olsen, and Mitchell auto physical damage solutions sales Senior Vice President Jack Rozint. Tracy’s presentation will also include his latest crash test data regarding a Honda Fit repaired using OEM parts and procedures. The test, a followup to a December trio of 45 mph moderate-overlap crashes, illustrated the difference between a repair with new parts and a vehicle repaired using OEM procedures but with aftermarket procedures, according to ABAT President Burl Richards (Burl’s Collision Center). Quinn, whose company sells the AirPro scan tool, suggested that collision repairers outsource electronics work, arguing that shops had enough on their plate just ensuring a correct structural repair. But those who wish to handle such work in-house are going to need to make sure to keep sufficient documentation for liability purposes, he said. He said he hears of “less than honorable” shops charging for scanning and not even reading the diagnostic report, seeing it as a paycheck. But a list of codes alone was “not going to cut it” as documentation either for the shops who actually did the right thing with that information, Quinn said. A shop needed records about what it did with that list, such as what procedures were researched, what was the version of that information, and what were the qualifications of the party making repair decisions, according to Quinn. AirPro conducts both remote scanning and remote calibrations (once the shop sets up the car and targets), and it documents this process heavily, Quinn said. The company captures screens on every calibration and programming event it conducts with a shop, records its phone conversations with repairers and tracks who on AirPro’s side made a particular decision, he said. Quinn said AirPro hasn’t had to provide such documentation in a legal setting, but it has been referenced by the company in other circumstances. He offered a customer comeback to the shop or a subsequent collision as situations in which such records would be useful to prove everything had been done right. Quinn also on Monday raised the issue of insurers refusing to cover safety operations — which one attorney has suggested doesn’t absolve the shop of liability. “I really find this troubling,” he said. Attend the liability panel and other speakers’ sessions by taking advantage of early registration for the Repairer Driven Education series and OEM Collision Repair Technology Summit at SEMA. Classes and individual OEM Collision Repair Summit sessions are $75 now, $85 after the Friday, Oct. 12 early bird deadline. The best deal is the full-series pass for $375, $400 after the deadline. It grants the repairer access to every RDE class, all three sessions of the Thursday, Nov. 1, OEM Collision Repair Technology Summit, the Sky Villa afterparty in Elvis’ old Westgate penthouse that night, and the brand new IDEAS Collide TED-style event Friday, Nov. 2.